Day in and day out, I see what happens when people get dogs for protection and aren’t prepared for the realities of living with working dogs. Unfortunately, it’s a growing trend, particularly in a day and age when everyone is looking for something new, exciting, and different. When they get into trouble with the dogs—which they almost always do—they turn to popular “scientific” trainers (read: fanny packers), and the problems only get worse. I’ve been involved with working dogs for years. I have a protection training program. And I want to have some straight talk about working line dogs and why most people should not have them. Please note that this is not a comprehensive discussion of all working line dogs. I’d say that the top three breeds I see these days are German Shepherds (GSD), Malinois, and Rottweiler. First, a quick talk about breed. I want to start by talking a little about expectations. In the past several years, I’ve been noticing a real shift in the expectations that people have of their dogs, expectations that are sometimes not reasonable and that often have nothing to do with the dog himself. The internet is filled with “What dog breed should I get?” quizzes at the same time that it’s easier to get a puppy of any breed someone may want. Usually, the breed suggestions are wildly inappropriate. Dog breed choices have become aspirational—just like baby names or getting a new car. And now, it’s popular to have working dogs. There are many motivations for this—movies like “Max” or wanting to be perceived as tough. I don’t really want to dwell on motivation, as much as point out that this is a real cultural shift. It’s easy to get caught up in. But I also want to use this opportunity to level set a bit. We have been breeding dogs for a purpose for thousands of years. Protection. Hunting. Herding. Even just companionship. This may seem patently obvious, but it makes a big difference when looking for a dog. Let’s say you want a dog that’s happy to hang out all day with minimal exercise. Choosing a husky just doesn’t make sense. Or let’s say you’re very active and want a dog to hike with. A pug may not be your best bet. So, what is a working dog? For those who aren’t sure, working dogs are those who are still being used for the work they do. They are dogs that do police work and/or personal protection. They’re guard dogs that patrol and protect property. They’re farm dogs, sled dogs, and so on. I am focusing primarily on the protection and guard dogs here, breeds like GSD. In fact, let’s use GSD as an example, because the first thing to understand is that there’s a difference between working lines and show lines. Let me explain. It’s tempting to think that GSD is a GSD is a GSD. But breeding occurs every single time a dog has a litter—and how the parents, grandparents, etc. were worked, used, and bred are going to influence the temperament of the pups you get in the litter. Working lines have have been selected and bred for working characteristics, which include higher prey drive and higher defensive drive, as well as a whole host of other things that make them good for that particular work (but not so good for pet dogs). In contrast, show line GSD may technically be the same breed, but their work is primarily the conformation ring. They are removed from their working roots, and have been bred for more cooperation and reduced drive. Let me add: there is nothing wrong with getting a show line dog. I am not a fan of kennel clubs such as the AKC for a variety of reasons, but a show line dog is often the better option for most people. On a side note: In my opinion, getting stable GSDs in general can be difficult. If GSD are bred properly according to breed standards, they can be almost impossible to handle. The workaround in the United States was to mix working and show lines. The goal was to make the working dogs a little easier to handle, and give the show line dogs a little more zip. In my experience, these mixes tend to be unstable dogs. They have conflicting drives that interfere with their nerve; terrible fear and high defensive drives are a bad combination. Even the breed’s founder said that you should never mess with the nerve of a GSD. You don’t buy a Hummer and expect it to have the fuel economy of a commuter car. No one bats an eye when an otherwise lazy lab is described as “ball crazy” or a border collie nips at the kid’s heels. We recognize that these are typical traits of the breeds. So why are people running out and getting high-drive protection dogs without first understanding the traits of these dogs? To put it bluntly, protection dogs are bred for aggression. That’s what they do. They are bred to bite and do serious damage to bad guys. This is what they think about. This is what they know. Do you expect the dog to vigilantly protect your home or your person using violence and teeth—then then go to the dog park, be good with all kids and strangers, and snuggle on the couch at the end of the day? It just doesn’t work that way. It doesn’t work that way with the extensive training these dogs need. And it sure doesn’t work without it. There’s a pervasive idea right now that environment trumps genes—that if you just raise them right, everything will be fine. (And don’t get me started on what a lot of raising them right constitutes these days, starting with inappropriate and downright harmful “socialization.”). Guess what? This is false. Temperament is a function of genetics, and temperament will always out. This usually starts occurring at about the six-month mark. People come to me all the time saying, “I don’t understand. My rottie was fine as a puppy, but all of a sudden he’s guarding his food bowl and growling at me.” This is not a surprise. This is a guarding breed. This is the dog’s genetics. And it’s only going to get worse as the dog matures. No matter what you do, no matter how you train, these urges don’t go away. They can (and should) be controlled and directed appropriately. But they’re not going to disappear. And often working traits are associated with other, less desirable traits in a family dog. Depending on the individual dog and the particular breed, you could get dog aggression. Not tolerating children. Wanting to bite every stranger that passes. Challenging you in your own home. Guarding from you. Are you prepared? Because this is the stuff that happens. Mostly, working dogs in typical households ends badly. I can’t tell you how many times I see someone get a Malinois off Craig’s List (unstable dogs from puppy mills—avoid, avoid, avoid). They go down to the local pet trainer who tells them all about bite inhibition—because of course, conventional puppy training says NO BITE! The thing about mals is that they are bred to bite. This is what we want. They practically emerge from the womb biting. The drive is so strong, they actively NEED to bite. When they are not allowed to bite, frustration twists and perverts an otherwise clean and healthy drive. Working line dogs need to be raised and trained appropriately from the beginning, by people who understand their drives and their sensitivities. Raising working dogs is a real art, and is far too often done poorly because there are some aspects to it that fly in the face of conventional wisdom—like the biting example above. And with some breeds, if the training is bad, they will never recover. Generally, it’s easiest to fix issues with GSD. They may be really out of control jerks, but generally a leash correction will pop them out of drive, so you can start making long-lasting change relatively simply. This is less true of Malinois (and Dutch Shepherds). The thing about these dogs is that they are simultaneously high drive but also extraordinarily sensitive. They have excruciating fear periods. If you get to about ten months with them and mistakes have been made, it can be too late. You just can’t fix it a lot of the time. And it’s not just a question of raising them properly. The fact is, there are dogs that you can have, and dogs that you have to handle. These dogs require handlers that know what they’re doing, because the very qualities that make them good at their jobs also require people who know how to control those drives. Remember—the things we have bred them for leak over into other parts of their lives. We don’t always get to pick and choose only the characteristics we want, like a tapas menu. Finally, let me say that it seems to be very popular right now for people to “play at working dogs,” mostly in the context of protection sports. I am talking specifically about positive trainers who want the bicep bite glory photos and focused heel videos they can post on social media. 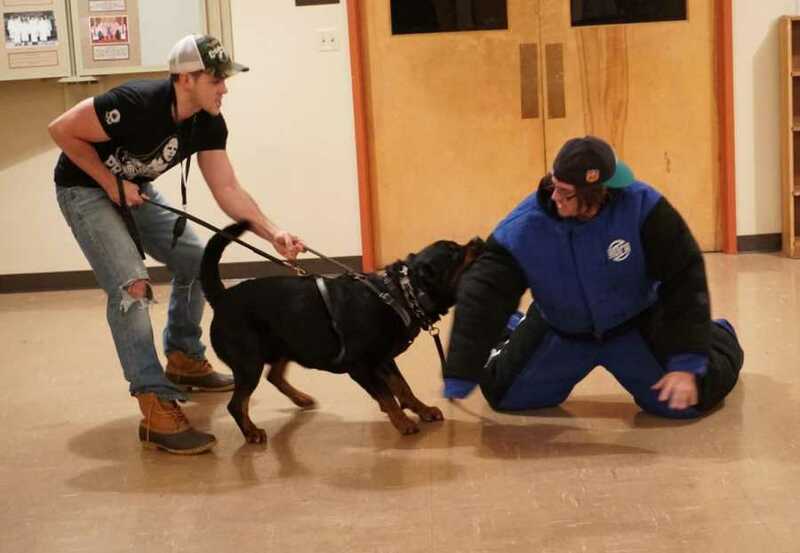 They like to use these as examples of “positive training works for all dogs.” In my opinion, these people have no business messing around with working breeds. They don’t understand the dogs. They don’t know how to raise them, they don’t understand how to handle them, and as far as I can tell, they have absolutely no idea of how to work with drive properly. There are bunch of them who use dogs like Golden Retrievers on the IPO field. I think that’s about as silly as harnessing up a beagle team for the Iditarod, but I wish they’d stick to that. Do you still want a working line dog? I get it. People love certain breeds. Here’s my advice to you. First, learn to read a pedigree. What you’re looking for is as little linebreeding as possible and examples of the kind of work you’re looking for in your dog. If you want a nice family dog, get a show line. They’ll bark at intruders, which is all most people really need. They can be easily taught a bark and hold if you want. I highly recommend enlisting the help of someone familiar with the breed and not affiliated with a specific breeder. There are many fantastic breeders, but there are also unethical breeders; it can be hard to differentiate between the two. Be particularly careful with show line GSD. I see far too many young GSD that are just broken down and crippled from breeders who just want to make a buck. Do you still want a working line dog? First, ask yourself some hard questions. Are you ready to forego social interactions with other dogs? Will you be okay with possibly having to separate the dog when people come over? Who will look after the dog when you go on vacation? How much time and energy do you have for training? What is your budget for dog and for training? This kind of training is not cheap. I will tell you right now: I generally steer people away from getting a Malinois. They are far too easy to ruin, and they bond so closely to one person that rehoming them can be just devastating to the dog in the case it doesn’t work out. But overall, please get someone to help you. It is worth the money to have someone who is knowledgeable with breeds and bloodlines help you choose the right dog for what you want. There are far too many unstable dogs out there being bred indiscriminately by people who want to make a buck.